In the spring semester, Eugene Lang College faculty will host two discussions that address the current criticisms and engage students in an open dialogue on the value of an education at The New School. 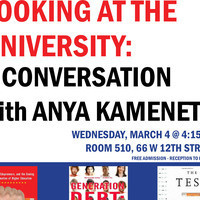 In this second event of the series, join Literary Studies co-chair, Carolyn Berman in a conversation with Anya Kamenetz, the author of Generation Debt, DIY U, and The Test. Kamenetz is the author of several books about the future of education, including Generation Debt (Riverhead, 2006), which dealt with youth economics and politics and DIY U: Edupunks, Edupreneurs, and the Coming Transformation of Higher Education (Chelsea Green, 2010), which investigated innovations to address the crises in cost, access, and quality in higher education. Her latest book, The Test (PublicAffairs, 2015), is about the past, present and future of testing in American schools.